Have you ever dreamed of having all the luxuries and facilities of a 5 star hotel in the privacy of your own home? If so. Have you ever dreamed of having all the luxuries and facilities of a 5 star hotel in the privacy of your own home? If so, Villa Sophronia is the place you. 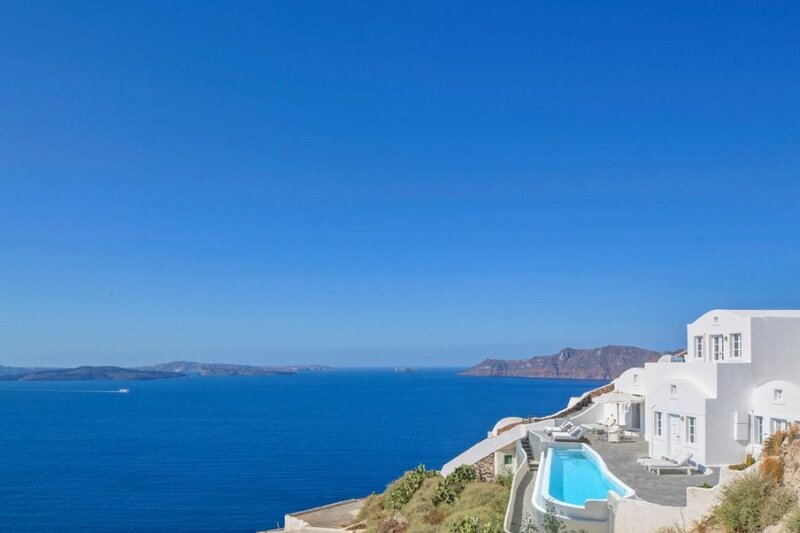 The magnificent Greek villa on the island of Santorini offers privacy, exclusivity and unique views in a glorious location on the edges of the village of Oia. The amazing panoramic views, traditional architecture and carefully chosen decor will make your stay on this beautiful island a truly unique experience. The Villa offers three bedrooms that all come equipped with comfy double beds, en-suite bathroom, air conditioning, LCD TVs, bathrobes and VIP bathroom amenities. There's a spacious living and dining area with LCD TV if you feel the need to get out of the sun, along with a fully equipped kitchen and a spacious veranda with heated Jacuzzi – everything you need to make each second of your holiday truly luxurious and relaxing! Good news! This property is available as a Vill'otelYey! Wait… what is that? It's the perfect combo of the privacy of your own personal villa, with all the luxury and convenience of a hotel. What's included? The villa consists of three king bedrooms, all of which come with their own bathrooms. One Bathroom has a bathtub, while the rest come equipped with a rain shower. All king beds can easily be split into twin beds upon request, and each bedroom has a beautiful view over the Caldera and the Aegean Sea. Inside is a very large living room with a dinning area and a large kitchen (where cooking classes can easily be arranged). Outside, you'll find the large terrace with its amazing views and the brand new Infinity Pool (available April 2015) that will spoil even the most demanding guests! Villa Sophronia can be found right in the start of a charming Greek village, and is within easy walking distance from many great restaurants, cafes and shops. Only 50 meters from the villa, you'll find the lovely marble path that leads right to the sunset point. Fira, the main center of the island is only 11 km from the village, and the airport and Santorini's port are both less than 20km away. If you'd like to book the Vill'otel serviced option, contact us on for a tailor-made quote! Typical costs range between £100-£250 per person per week dependent on requirements. Thanks to its location, Villa Sophronia is available fully catered by a range of hotel services. When you choose Villa Sophronia, you're choosing privacy and exclusivity with the added support and services of a boutique luxurious property.